Wow! Absolutely beautiful, incredibly quiet and responsive action. Thank you!!! What a finely made work of art. It is absolutely beautiful!!! I put it on the air hours after I received it and worked 3B9FR on Rodriquez island, RU3EG in Russia and several more. I am proud to display such a beautiful key in my shack! Check out the great review by N1ABS! It’s a whole new thing…no springs or magnets to mess with. Just plug it in, adjust the contact travel to your liking and experience one of the quietest and smoothest straight keys you’ll ever use. All components are made by hand. All brass parts are mounted to black granite and then mounted to an American Cherry or Walnut base. Even the knob is hand turned with a mother-of-pearl signature dot. 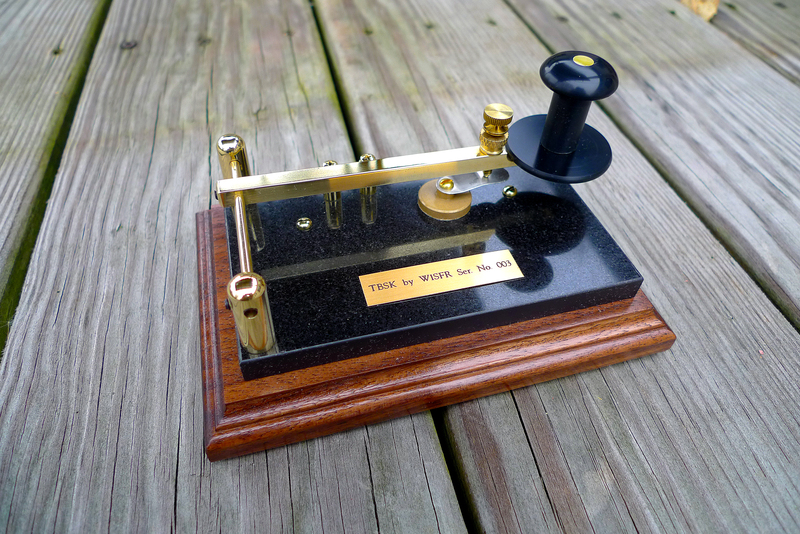 Wood base measures 4″ x 6″ and each key comes with a custom made 3.5mm cable. Each key will come with an engraved plate: “W1SFR Torsion Bar Key”. Price US $245 + $12.50 Priority Mail Shipping. International customers please email for shipping costs to your country.